The Olympians are off in search of hairy snakes–whatever that means. Aphrodite’s newfound magical object, a golden apple that makes gold coins on command, helps the Olympians buy food for their journey. The shiny gold coins attract the attention of a mortal boy, Perseus, who tells the Olympians that the mysterious Gray Triplets hold the secret to finding those hairy snakes–and he is happy to take the Olympians to meet them. But when they arrive, the heroes discover that Perseus isn’t who he seems to be. 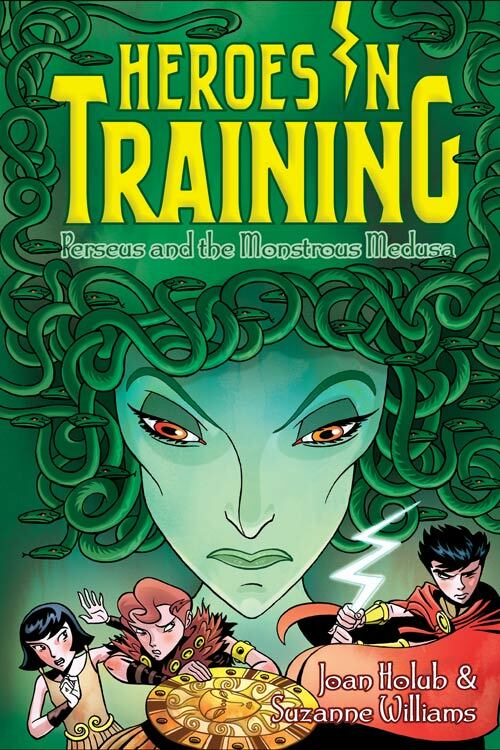 They find themselves in the clutches of the evil, nasty Medusa, who can turn them all to stone with one look–and may be the surprising key to those hairy snakes!